Even dough is lightweight, it has some interesting functions, like Code Preview or Quick Edit. Quick Edit offers a simple and intuitive interface, offering the user the needed tools for manipulating the code, while the Core Preview mode allows the user to quickly move through the source code for an easier edit. Cross-browser Live Preview with Dev Tools: Although disabled by default, you can try out this brand-new version of Live Preview by enabling the livedev.multibrowser preference. The new Live Preview opens in your default browser, but you can paste the URL into other browsers and they’ll all update at the same time. And you can use the browser’s dev tools without interrupting Live Preview. Does not currently support pages that use your own custom server. Windows High DPI support: To enable, right-click the app icon and select “Disable display scaling on high DPI settings” in the Compatibility tab. (The window controls in the upper right do not rescale yet, however). Allow typing accent characters with AltGr: Brackets shortcuts that use Ctrl+Alt no longer supercede typing letter keys via AltGr. Select enabled code linters via preferences: For example, different projects can use a different set of linters. Programming language-specific preferences: Use the new “language” layer to set preferences based on file type, in addition to the path-specific or global preferences possible previously. New event dispatching system: Brackets core objects use a new event-listener API that protects against misbehaved extensions. See below for details. Improved typing performance while code hints open: Brackets limits the displayed list of code hints to 50 entries to improve performance. To override this limit, set the “maxCodeHints” preference. Improved performance when lots of files are changing in the background, such as large source-control checkouts or complex Grunt build scripts. 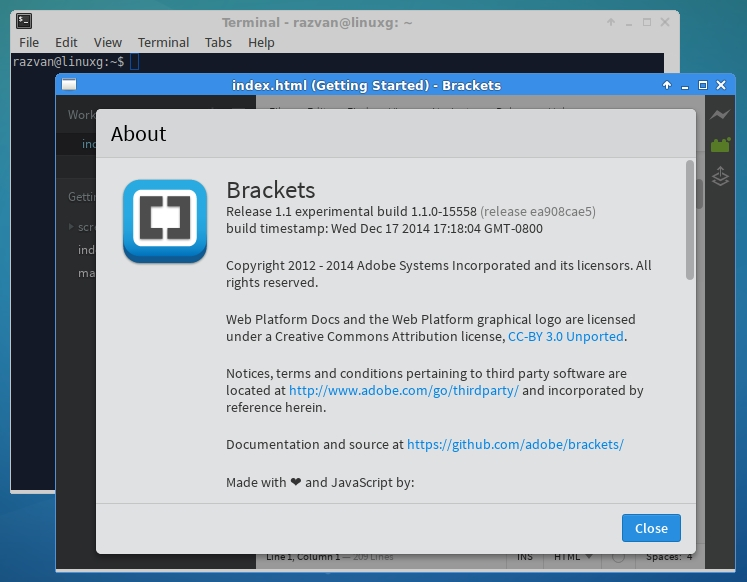 In this article I will show you how to install Brackets 1.1 on Ubuntu 15.04 Vivid Vervet, Ubuntu 14.10 Utopic Unicorn, Ubuntu 14.04 Trusty Tahr, Ubuntu 12.04 Precise Pangolin, Linux Mint 17.1 Rebecca, Linux Mint 17 Qiana, Linux Mint 13 Maya, Pinguy OS 14.04, Elementary OS 0.3 Freya, Deepin 2014, Peppermint Five, LXLE 14.04, Linux Lite 2.0 and other Ubuntu derivative systems.